The ongoing “regime of silence” [ceasefire] in Donbas is accompanied by shelling from Russian-terrorist troops, as well as measures to improve their combat readiness and the logistical means necessary to continue fighting. A powerful disinformation campaign is underway in social networks and the general media field, to conceal the accumulation of resources and the [ongoing] training of Russian-terrorist forces to further warfare. Information is spread that the “artillery is being taken away,” “the number of militias is being reduced,” etc. In reality, we have reports of the situation being exactly the opposite. 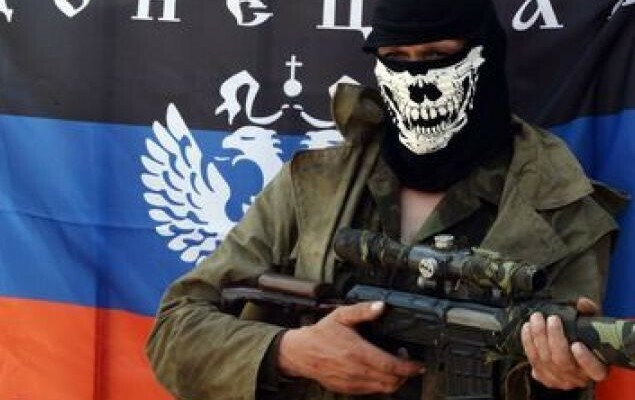 In particular, in recent days in the territory controlled by the “DNR” [Donetsk People’s Republic], the terrorist leadership was solving the problem of providing their insurgents with winter clothing using the resources coming from Russia on board the “humanitarian convoy” (the terrorist units fighting south of Donetsk – in the area of Dokuchaievsk, Olenivka, Telmanove – were particularly unprepared for winter). Also, the accumulation of other logistical resources continues, including fuel, ammunition, and spare parts for military equipment. Over the past weekend (12.13-14.2014), we recorded the arrival of at least 2 columns with refueling companies (up to 40 cars) from the Russian Federation. The advanced positions of the Russian-terrorist troops in the western sector have been significantly reinforced. The new checkpoints and hidden positions for artillery and armored vehicles have been equipped and carefully camouflaged. Reinforcements withdrawn from Yenakijeve and Makiivka militia units have been pulled up to the flanking positions of the Debaltseve springboard. Fresh units of Russian military servicemen (up to 2 company task groups) pulled up to the area of Verhulivka from the direction of Alchevsk (we mainly counted contract soldiers from the units and formations of the Southern Military District of the Russian Federation). Over the last weekend, an advanced composite company task group with one of the Russian motorized infantry brigades, reinforced by two artillery batteries, spent many hours shelling advanced Ukrainian positions from the direction of Hryhorivka (Telmanove District). Prolonged fire was also delivered onto the positions of Ukrainian troops in the area to the north of Vesela Hora (from insurgent positions to the east of Luhansk). A new insurgent “battalion” is being formed in Krasnyi Luch. According to our reports, this new unit includes only a few locals, consisting mainly of Russian mercenaries who arrived from Russia with “humanitarian convoy” #9. Most of the mercenaries are representatives of fringe population groups. Armored vehicles were reported moving towards Shchastya – 3 terrorist tanks were being moved back to positions after repair. The “DNR leadership” is concerned about cases of “mass marauding” on the part of its “militia.” A closed meeting was held by the “DNR” leadership to discuss this problem. According to the statement made at the meeting, during the last week, over 100 marauding insurgents were detained and caught red-handed.